A team of 11 members of various organizations visited the families of workers as well as police stations and courts in the Shahjahanpur, Neemrana and Behror areas, Alwar district, Rajasthan, in the wake of the news of alleged police repression upon workers who participating in the All India Worker’s Strike, which took place on January 8-9. The fact finding team – consisting of Sumeet, Workers Solidarity Centre; Yogesh, Inquilabi Mazdoor Kendra; Subhash, Shramik Sangram Committee; Gunjan, Human Rights Law Network; Tarachand, Human Rights Law Network; Bittu, WSS, Karnataka Janashakti; Shailza, Women Against Sexual Violence and State Repression (WSS), People’s Union for Civil Rights (PUCR), Haryana; Sarla, PUCL Jaipur; Nisar, PUCL Jaipur; Mukesh, Mazdoor Kisan Shakti Sangathan; and Nayan, Krantikari Naujawan Sabha – in its report said that the arrests in the wake of the protest were “arbitrary and backed by no evidence”. It said, “The workers who were arrested were not even named in the FIR, which names 700 “unknown” people – this has clearly been misused as a tactic to pick up any number of workers”, adding, there was “deployment of bouncers to intimidate workers and their families at home and on the company premises”, backed up by the police, which too intimidated the workers. On January 8, 2019, as part of the All-India Worker’s General Strike called by all central trade unions, 2,000 workers in the Japanese Zone in Neemrana industrial area participated in a rally. The permanent, contract and fixed term contract (FTC) workers of the Daikin Air Conditioning Mazdoor Union took part along with workers from several other companies such as Honda, Toyoda Gosei, Shyon Ultraware, Nidec and others. State repression upon this mobilization had already begun at 5 am with a team of bouncers attacking workers armed with lathis and chains, seriously injuring one worker named Vijay to the point where he needed to be hospitalized and treated for traumatic injuries to his head, a gashed eye, and wounds on his hips and leg. Later around 2 pm, when the worker rally reached the Daikin company gate and tried to raise the union flag, they were again brutally attacked by a combination of about 150 police and 150 hired bouncers. The workers recognized the bouncers from prior attacks motivated by the company management. The police lathi charged workers and also deployed rubber bullets, tear gas and water cannons against women and men workers alike, grievously wounding 40 workers, with many people requiring hospitalization for fractures and head injuries. The injured workers included men and women, permanent and contract employees at various different companies, but the president of the Daikin Air Conditioning Mazdoor Union, Rukumudeen and the general secretary Daulat Ram, were also particularly targeted. On the night of January 8, between 11 pm and midnight, several workers were picked up from their homes in raids. By January 9, 14 workers were in police custody. The fact finding team spoke to the families of several of these workers as well as to the police. All the families that spoke to the fact finding team stated the time and place of arrest to be between 11 pm and midnight on January 8, at their residence. As per the law this means that they should have been produced before the court on the January 9, within 24 hours of arrest. Instead, all the workers were produced before the court around 4 pm on January 10, 2018. This would constitute a serious violation of the law by the police and is a matter of concern. When the fact finding team enquired with the police about this, the investigating officer in the case, Jai Prakash, Shahjahanpur police station, claimed that the workers were arrested from “various places” on January 9 by the police from the Neemrana PS, and were held there overnight. Police from the Neemrana PS, Alwar, asked us to direct all enquiries towards the Investigating Officer (IO). The IO and the policemen from the Neemrana Police Station both resolutely refused to give any members of the fact finding team, the workers’ family, or their lawyer a copy of the FIR which was registered at Neemrana PS. The IO only confirmed that a total of 14 workers had been arrested, who names were reported in the news: Mahesh Kumar, 30, from Jhunjhunu; Ghanshyam Saini, 26, from Alwar; Surendar Kumar, 28, from Himachal Pradesh (HP); Jagdev, 26, HP; Ajay Kumar 35, HP; Sukh Ram, 28, HP; Avinash Chandra, 27, HP; Praveen Kumar, 26, HP; Pankaj Chaudhary, 30, HP; Ranjeet Kumar, 26, HP; Sujit, 31, HP; Deep Singh, 25, UP; Ajay Thakur, 25, from Orissa and Lal Chand, 28, Orissa. Sections 147, 148, 149, 307, 332, 336, 353, and 427 of the IPC and PDPP were applied on the arrested workers. In a bizarre manner, none of the workers who were arrested are named in the FIR. The FIR names and targets 17 people, starting with Rukumudeen, the President of the Daikin Air Conditioning Mazdoor Union. 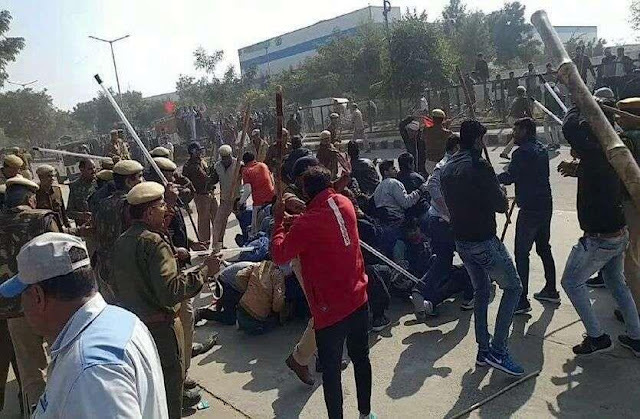 The workers’ families state that the workers were picked up near midnight by a team of police from all three nearby police stations: Shahjahanpur, Neemrana and Behror, all from Alwar district. During the arrests, the police also committed excesses, kicking Deep Singh while swearing at him, while dragging him out of his home in Behror around 11 pm. Champa, wife of Ajay kumar, said the police who came to arrest him were drunk and disrespectful towards her. They showed up at the home at 11:45 pm when both members of the couple were unwell and resting, and Champa even lost consciousness while the police raid took place. Preeti, wife of Ghanshyam Saini, said that 8 policemen jumped in to their compound in Behror, without ringing the bell, shocking her and their two children, aged 2 and 3 years old respectively when they were sleeping. Her neighbour, Lal Chand Meher was picked up next, and his wife, Jyoti, showed the fact finding team City Hospital records demonstrating that he had already been injured in the lathi charge. He was prescribed medicines for a wound on his thigh. Sanjukta, wife of Sujit, also said her husband had been injured in his leg during the lathi charge, and 12 policemen barged into her home, scaring her 8 month old baby. Sanjukta had also noticed her husband in media footage of the lathi charge clearly showing that her husband was being one-sidedly beaten by police. She asserts that he was a very gentle person who could never ever attack anyone. Ajay Thakur’s wife Sunita wondered if police were choosing to arrest those people who were visibly getting beaten by police in media coverage of the event. Pankaj Chaudhary’s wife Parveen testified that the contractor accompanied the police when they came to her home where she lives with her husband and 2.5 year old baby. This baby was crying out for the father. Roommates of one of the workers stated that Human Resources personnel at Daikin also accompanied the police. Many workers also felt that it was not a coincidence that most of the arrested workers were not locals from Rajasthan. Workers also testified that for the last several months a communal angle had been propagated by the management, targeting Rukumudeen, the Union President. Workers were told that in electing a Muslim President they were creating the potential for riots. Most of the arrested workers whose families we spoke to were permanent workers, except for Deep Singh who was a casual worker. Workers felt that the unity of permanent and contract workers and the demand for permanent employment of contract workers was particularly resented by the company. The first attempt at forming the union was in 2013, with a two month strike, but the management was able to bring a stay order against the formation of the union. A later attempt to form the union was countered by terminating most of the union office bearers and active members. Finally on August 29, 2018 the third attempt to register the union was successful with intervention from the Rajasthan High Court, but management refused to recognize the union or negotiate with the office bearers, despite it being an independent, non-affiliated, registered trade union. In retaliation, management transferred 15 workers into various other service locations. Since 2013 about 50 permanent workers have been sacked and countless more contract workers in the struggle to register the union. The struggle continued and on two occasions when the union tried to hoist the union flag, it was forcefully removed by the bouncers of the factory. The Daikin union however is recognized by workers as being truly independent of management and resilient in the face of repression. It has successfully challenged unfair labour practices, and enabled 70 FTC workers to join the rolls of permanent workers. With this struggle, workers state that the first plant, Plant A has shown major improvements in working conditions. However, a newly opened Plant B has more than 400 women, mostly migrants from Chhattisgarh and the North East has worse working conditions: work pressure is high with high line speed and not enough provision for reliever workers, leading to constraints in taking toilet breaks, and intense pressure from the management. Many Plant B workers participated in the strikes on January 8. These working conditions are widely prevalent in many other companies in the area, and the consolidation of workers across many factories in Neemrana Mazdoor Manch, and then Mazdoor Sangharsh Samiti, Alwar, was perceived as a threat by all these companies and the repression must be seen in that context. Since 8th January, the plant has been closed. The arrests appear prima facie to be arbitrary and backed by no evidence. The workers who were arrested were not even named in the FIR, which names 700 “unknown” people – this has clearly been misused as a tactic to pick up any number of workers. These false cases should be withdrawn and immediately release all arrested workers. The deployment of bouncers to intimidate workers and their families at home and on the company premises as well as police to intimidate workers should be stopped immediately. The use of unfair labour practices, contractualization, oppressive working conditions and retaliatory actions of forced termination or transfer of active union members should be ended. The union should be recognized by management and the democratic and trade union rights of the workers should be recognized.